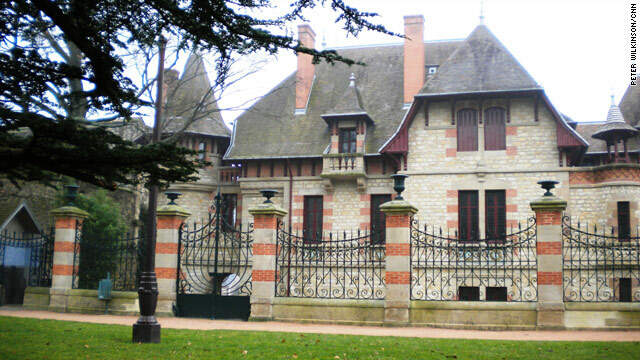 Moulins, France (CNN) -- One of the most eccentric dying requests has finally been fulfilled as a mansion closed for most of the 20th century reopens to the public. Maison Mantin was left to the town of Moulins in central France by Louis Mantin, in a will written months before his death in 1905. The landowner, who had inherited several properties, died unmarried and childless aged 54, only eight years after his house was completed. Despite rumors that Mantin had demanded the house be closed for 100 years, there was only one condition for the gift: that was that it should be opened as a museum a century after his death. If it was closed any longer, ownership could revert to any surviving relatives. "Mantin was obsessed with the passing of time, and death," said Maud Leyoudec, assistant curator of Maison Mantin. "He wanted the house to remain unchanged, like a time-capsule for future generations, so they would know how a bourgeois gentleman lived at the turn of the 20th century." The mansion was briefly a museum following Mantin's death, but there was little interest and it soon closed. For most of the rest of the century, even as two destructive wars raged nearby, it remained shuttered, an unchanging, mysterious presence in the shadow of Moulins' cathedral. Rumors circulated that a collection of skeletons was stored inside, but most locals simply gave a Gallic shrug to the imposing property. Even the German occupiers of France during the 1940s left it unscathed. As the deadline for the house to reopen approached -- and with Mantin's great-niece, who could theoretically reclaim it, alive -- attention turned to the restoration. Houses left unoccupied tend to fall apart and Maison Mantin was no exception. When Leyoudec visited in 2004, shortly before the restoration got under way, she was shocked by its dilapidated condition. Mantin was obsessed with the passing of time, and death. He wanted his house to remain unchanged, like a time-capsule for future generations. "There was woodworm and damp caused by the house not being heated, and many of the elaborate wall coverings were torn," Leyoudec told CNN. "There were insects everywhere in the house -- it was really awful." A team of about 30 specialists were involved in the project to restore the mansion, and after four painstaking years it has now opened as a museum. Maison Mantin is unique, Leyoudec believes, because it is exactly how it was in 1905. The house had many advanced creature comforts, including electric lighting, flushing toilets, under-floor heating and even secondary glazing, but also features period art nouveau touches such as stained glass and much carved wood. Mantin's great-niece was supportive of the restoration, Leyoudec said, and just as well because the museum opened more than five years after the centenary of his death. The relative did not interpret her ancestor's will too literally, and so luckily for the townspeople of Moulins the unique house remains theirs. While Louis Mantin's unusual gift may have been philanthropic it was also egocentric, as Leyoudec pointed out. "Now everyone in Moulins knows his name."